South of N.H. Route 103, two miles west of Warner Village on New Market Road across the Warner River in Warner. The bridge is 76'4" long with a clear span of 70'9". It has an overall width of 16'11", a roadway width of 12'11", and a maximum vertical clearance of 11'10". It is posted for six tons. 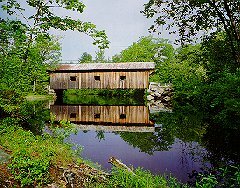 The structure was completely rebuilt in 1857 by Dutton Woods of Contoocook. It was rebuilt a second time in 1970, at a cost of $16,300 under the state Town Bridge Aid Program. Finally, the bridge was rehabilitated by the state in 1987 at a cost of $3,000. The Waterloo Bridge is listed on the National Register of Historic Places.